Do NOT let @RadioShack try to fix your iPad screen! Bad things will happen! They’ve currently turned what should have been a two-hour operation into a five-day crawl, and it’s all apparently because the company won’t keep its repair crew fully stocked in replacement equipment – and will not streamline its emergency parts requisition system. I’m not mad at the tech on this. The tech didn’t do anything wrong. I’m mad that her superiors have to sign off on apparently every little thing. When Radio Shack announced that it was doing a full revamp of its store, I figured that they deserved a chance at my future business. This was their chance. They have already flunked, and the second I get my iPad back I’m going to walk away and never return. …under the same email address for two separate data plans. I have no intention of having them share the same data plan, either: the entire point of the Kindle HDX is to still have my own tablet even when one of my children has vultured the iPad. 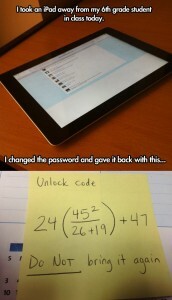 I believe that the answer to that ‘unlock your iPad’ question is 1127. So *that’s* why the Morgan Freeman stuff yesterday. …but when you look at it the second time, there’s just something about the eyes. I can’t even put my finger on what, so I may be deluding myself. Still: an impressive use of the iPad. New tablet question: #ipad, or #surface? The iPad is starting to have that ‘can’t keep a charge’ problem; it’s still fine for the kids, though. I’ll be honest, though: I’m hearing enough good things about the Microsoft Surface that it’s a definite possibility. It’s fun making the iPad act outside of the parameters forced upon it by Steve Jobs… but, well, maybe it’s time to get off of that train. Now, if either Apple or Microsoft wishes to influence my decision – which I will of course social media about, ad nauseam – well, they can always contact me about that. This isn’t politics: I can be… persuaded. Hey, look! KOTOR for the iPad! In one of the stealthiest launches in some time, Aspyr Media has released a port of Star Wars: Knights of the Old Republic today for iPad. The original BioWare game came out on the Xbox almost 10 years ago in July 2003. You have to wonder why they didn’t try to make more of a splash with this, though; that article is from the end of May. Anyway: ten bucks. Works on the iPad 2 and later tablets (dunno if the Mini). Just got my OGRE Kickstarter PDFs. The OGRE Book and the OGRE Scenario book and the new PDF version of the OGRE Miniature rules. Looks pretty nifty; and I should note that iPads are really nice when it comes to reading PDF versions of something. The slightly smaller screen is (in my opinion) more than made up for by the increased portability; I like laptops and netbooks, but they kind of need flat surfaces. …Anyway, that’s what I’ve been doing for the last couple of hours. That, and wishing that it was May so I could get The Big Box Of OGRE. Thanks to Barack Obama, you may not jailbreak your iPad. It will be illegal, starting in two days. The DMCA makes it legal to jailbreak an iPhone but not an iPad. The rule states that “telephone handsets” are allowed to make changes, but found that the definition of a ‘tablet’is “broad and ill-defined.” The Librarian ruled that because there’s no clear definition of what can be considered a tablet – according to the Librarian and manufacturers, an eReader, portable gaming device, or a laptop could conceivably be labeled a tablet – it did not provide an exemption for that class of device. One could easily point out that there is a considerable difference between an iPad, which is a tablet, and a MacBook, which is a laptop, but the Librarian found that there is enough gray area to warrant not offering an exemption that could then be widely applied to many form factors. This pleases Apple, of course; they purely hate it when people stubbornly insist on actually using Apple products in non-Apple approved ways. Which is probably why the administration made sure that the new rules were as inflexible as possible. And that’s pretty much it. …What? I didn’t vote for the guy. The best way to get a multi-format book e-reader? PS: BTW, if it isn’t obvious or anything: I’m an Amazon Affiliate for Maryland. Just disclosing that. …are now no longer working. I hope that this is an easily fixed problem, because (of course) the warranty’s expired and replacing it may… take some time. PS: I don’t think that anything got spilled on it, but I have small kids. What the heck: I’ll stick this on my Wish List.